Wow, what a full season it’s been! 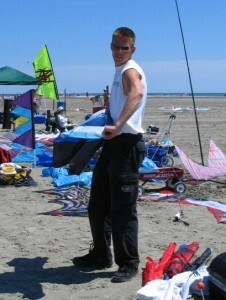 Kitelife has been represented at nearly a dozen festivals and competitions this year, making new friends, interacting with the spectators, and doing what we can to get more people working together toward common goals, and most importantly… Reminding people of the inherent potential that kiting has to offer, to view ourselves through fresh eyes and bravely reach for the skies, so to speak. I truly believe that we’re on the verge of growth again as a sport and pastime, particularly here in the USA where we’ve come through a few lean years recently… Our success relies on global cooperation and faith by way of clubs, festivals and fliers everywhere sharing what they know with the general public. If we can do this starting now, we’ll be in good shape within a couple of years… Just keep an eye out for the opportunities, and do what you can. In this issue, we’re very proud to feature an interview with the 2005 world champions Team Cutting Edge from Ocean Shores, Washington… After eleven years of European champions, they’ve brought it back to the USA and we’ve got an exclusive for our readers here at Kitelife. Our archiving projects continue with another volume of Kite Lines magazine having been added to the on line collection a couple of weeks ago, working towards making available in PDF all the wonderful kite material they published between 1977 and 1999… Be sure to take a look through these old publications! As we go into the end of the season here, we’re looking at bringing you daily updates again from both the Washington State International Kite Festival (WSIKF) in August as well as the AKA Grand Nationals (AKAGN) scheduled for October in Ocean City, Maryland… If you can’t make it to an event, our daily updates really are the next best thing! Also, due to a recent increase in video downloads and the resulting bandwidth usage, readers may sometimes find the video archives restricted to subscribers as we approach the end of each month in order to conserve bandwidth… If you’d like uninterrupted access to them, be sure to subscribe– there are other benefits too! I hope you enjoy this latest edition of Kitelife, and please be sure to stop me and say hello if we cross paths at an event… We always like to know how we’re doing, and genuinely welcome suggestions or critique. This entry was posted in 2005, From the Editor, Issue 43 (Jul/Aug), Kite Columns, KL Archive and tagged archive, from editor, kite lines, kitelife, magazine, subscribe.